﻿ "Fresh, fresher and freshest are things that I stick to"
"Fresh, fresher and freshest are things that I stick to"
Gaggan Anand is an Indian chef born in Kolkata, India. 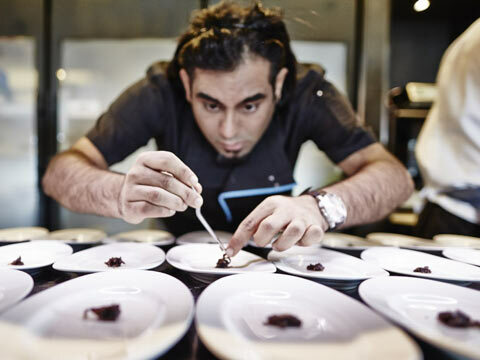 Today, he owns the most celebrated progressive Indian restaurant Gaggan in Bangkok, Thailand. Talking to Restaurant India, Gaggan shares some of his wacky ideas of dealing with food. What according to you is progressive Indian food? According to me, un-complicated, simplified and moving to new frontiers is way ahead for Indian food. Is your nose your sharpest sense while you come up with interesting mix of flavours? To me, mind and memory are two biggest senses when I plan to come up with some interesting flavours. And, nose is just a part of it. You are said to be a compulsive eater. Does that make you a better chef, too? When do you think you became The Gaggan Anand? It was when I started stealing money from my dad’s pocket for candies which he still doesn’t know. How do you work through mental/creative blocks? Haha! It is so simple, pass the problem to 10 other people working in kitchen in briefing and keep thinking together till it is solved. Are you ambitious? Where do you wish to take your brand? I am very ambitious; else there would have been no Gaggan. I want to take my restaurant through every foodies mind and to make them like Indian food and include it in their best eating experiences. What are your secret ingredients that makes you a sought after name? Fresh, fresher and freshest are three things that I stick to. According to me, nothing should be cooked before the plate is ready for pick up; it is a 200% commitment. Next gen dining experience with loofre..
Five Advantages Of Taking A Franchise..
3 Benefits of Having Practical Education..